Another fantastic adventure is Cliff Jumping. One has to be physically strong to embark on this thrill as it involves diving from a height of 35 ft. 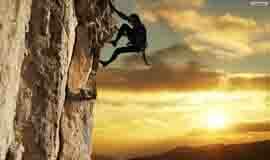 The adventure lovers can increase the altitude according to their fortitude and endurance. The experience of diving in the salubrious climate from maximum altitude will give you spine-chilling goose bumps. So brace yourself for the experience that you will remember for many, many years to come!It is indeed an exciting and adventurous experience to jump into the flowing river from the cliff that high. 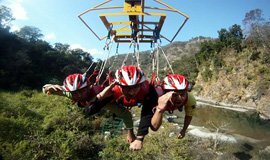 It can also become a part of your adventure as you relish the adventurous sports in Rishikesh. 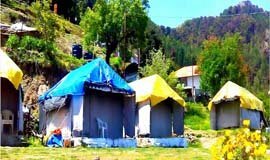 Camping brings the opportunity of staying amid the emerald beauty and tranquility of nature. Moreover, the visitors can relish impeccable service and lots of fun-filled activities along the side of sparkling blue water.Camp Wildex, Rishikesh is a riverside jungle camp far from the highway and away from everyone else. The pleasant sound of the rapids on the river echoes in the valley and camping around such an amazing natural surroundings is a lifetime experience in itself. It is the most challenging activity for all those who live life without fear. One has to dive from an altitude of about 120 to 160ft. After the jump, one can relish capturing pictures of beautiful surroundings on the camera. 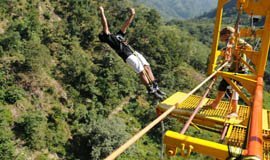 The jumpers also get dare to jump certificates which one must not forget to collect before leaving.We offer India's highest fixed platform BUNGY JUMPING (Bungee) at Mohanchatti near Rishikesh. A Cantilever platform built over a iron cliff over looking a rocky river HYUL, a tributory of River Ganga. Jump with rubber cords tied to your ankles and feel the adrenaline rush like never before. Bungee has been designed by David Allardice of New Zealand. Jump Masters flown in from New Zealand to operate the Bungee. After the Jump, the Jumpers are lowered down to a drop zone in the river which has only 2 feets of water. Experience another very famous activity known as Swing. It is carried out from bungee site from a height of 83 meters. One needs great strength to do it, but the experience is thrilling and elating. Travelers can also purchase the t-shirt printed with pictures of the giant Swing.Giant Swing is carried out from the same platform of the Bungee Jump. But instead of attaching a cord to your ankles, a seat harness is provided and two ropes are attached to it. So instead of a free fall after the jump, the ropes attached to the harness start swinging you like a pendulum hence acting like one Giant Swing tied from the height of 83 Mtrs. 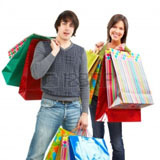 The activity can also be done by two people at the same time. 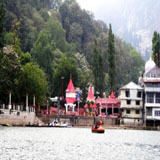 Recently, Rishikesh has developed into a trekking destination because of its location of the foothills of Himalayas. There are variety of trekking options available for the adventure lovers. 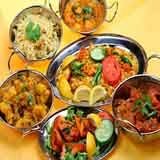 The trekking options depend upon the distance and the theme you choose. 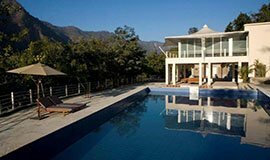 Some of the trekking options are Waterfalls Trekking, Kunjapuri Trekking, Neelkanth Mahadev Temple Trekking, Jhilmil Gufa Trekking etc. You can start a trek by yourself or can talk to any Adventure Tour Office. 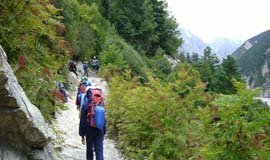 Due to the presence of tall Himalayan ranges in Rishikesh, it is one of the preferred location for trekking. 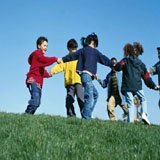 In this activity, you need to climb on a mountain peak by yourself. However, you are tied to all kind of safety harnesses to avoid any mishap. 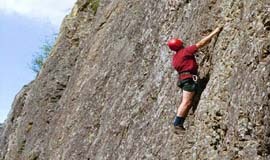 You will be a bit exhausted after completing Rock Climbing as it is a tiring but thrilling adventure.The sport of rock climbing has different definitions for everyone. for some, the adventure means challenging their stamina and strength.The sport of rock climbing has different definitions for everyone. for some, the adventure means challenging their stamina and strength. For others it is a way to announce the joy of arrival,. Trekking is an outdoor recreation where one gets to spend time scaling a small mountain or a hill. 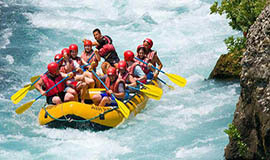 Rishikesh is the hub for adventure sports. It is surrounded by the Sivlik Mountain Ranges which makes it an attractive spot for adventure enthusiasts, travelers and tourists. Trekking here is one of the adventure attractions here. It is a great place for beginners to start trekking. This trek is a short one and you can cover 8 Kilometers in a time-frame of three hours. Trekking here would surely get you pumped up and give you the confidence and the bravery to walk in the wilderness. The trek midst the Himalayas, the soft sound of the river flowing along side is a heavenly experience. Challenge yourself and your physical and mental endurance by partaking in this activity. Recent day, in day to day busy life I would like to introduce some relax able enjoyment during your adventure tour called spider net. Spider nets are safe and very secure as point of human life as well as their enjoyment. I would like to say Spider net is also easily accessible and free walk able like a daily routine. This amazing adventure activity you can add your packages so you will not miss such wonderful adventure. This adventure surly add one of the best adventure in your precise life as well as your friends, etc. 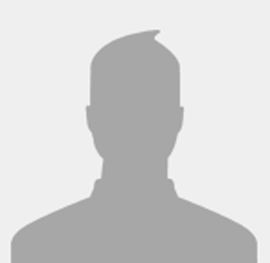 so don�t be late otherwise you will miss something. Today, travelers not only get pleasure from the stillness, but also participate in other recreational activities. Sports activities such as rafting, nature walks, and hikes made challenging and fun camp. 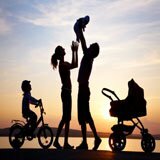 And it's not only fun, but also healthy as you feel young and energetic; once again face their daily challenges in this concrete Jungle Camp. 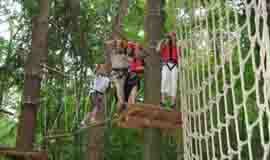 Rope Balance Rishikesh adventure activity is included in the high rope adventure packages. This activity is fully exploited by the safety harness and allowed to walk through one rope attached at both ends. You must cross balancing on the rope. It feels incredible sense of adventure. 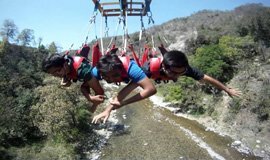 Include this activity in their adventure package with us. Departure for your personalized adventure package with us. 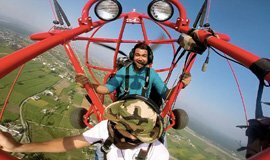 Air Safari in Rishikesh will take you to amazing heights of the sky with the help of powered parachutes by experienced pilots. Powered parachute is a type of ultra-light aircraft consisting of a motor and wheels with a parachute. Powered parachute is also known as paraplane or motorized parachute and abbreviated PPC. Powered parachute flies at an average speed of 40-60 km per hour. The average operating height ranges between 500 to 1500 feet. PPCs have a very short takeoff and landing rolls which can sometimes be less than 100 feet. 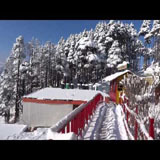 Enjoy the enchanting bird�s eye view of Shivalik Ranges of the Himalayas! The rich natural charm of Rishikesh makes it a popular place to explore the place by Air Safari! Rappelling is one of the upcoming adventure activities that have gained popularity in recent years. Rappelling means roping down a cliff, which is not only a fun activity but also a thrilling experience. 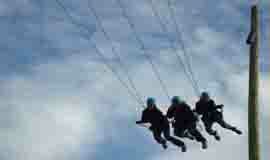 Rappelling is also called as Abseiling, one of the most daring adventure activities offered in Rishikesh. Same as White Water Rafting in the fierce rapids, Rappelling is also challenging. You can rappel down a cliff in various ways, the most popular being standing parallel to the ground surface with the legs on the face of the steep cliff. With the help of the right gear you can go ahead and climb down the steep cliff, and while you are doing that you would be watching and absorbing the breathtaking view of the panoramic landscape around. if rock climbing makes you go up, rappelling makes you come down, so have fun doing both when you are in Rishikesh.